On the Sixth Day of Blogging, Just Dusty Blogged for Me . . .
A political post; his specialtyyyyy! Here’s the truth: we all know what’s coming. It’s like watching a storm coming in: the clouds roll out across the sky like a cloth unfurling; first they are white, then grey, then black. The color leaches out of the world. The wind turns cold and biting, and then the first drops arrive: if it is a summer storm, then the big, fat splashes are refreshing, though the tang of ozone in the air is alarming. But I don’t think this is a summer storm. It feels like winter. Those drops are cold. We are shivering. When the storm hits in winter, it brings quiet. The wind may howl, but after it goes, everything is still. Frozen. Asleep, or dead. That’s what I think this feels like. Like the storm is coming, and we need to get into shelter, and cover everything. Anything left out will freeze solid, will turn black, will die. We have to cover ourselves, we have to batten down the hatches. And ride it out. But hang on: winter storms don’t kill everything. Yes, there will be some death: the EPA seems doomed, and Obamacare will be lobotomized, dissected, cut down into pieces too small to sustain itself any longer. Maybe the Department of Education, too, since the nominee for Education Secretary is against public education. Irrevocable harm will be done to the environment as new oil leases are sold, new mining contracts offered, coal dug and burned at will. Internationally, the day of the strong man is on the rise: the new administration will be a friend to Putin, and Netanyahu, and probably Assad and a dozen others who hold an iron grip with their right hand. America will no longer be the defender of freedom around the world. But then, we haven’t actually been that for a long time: we have defended our interests, and little else. That will continue, to the joy of the exceptionalists. Surely we will no longer fight against genocide or oppression: pity is the most delicate flower, and will be the first to freeze. But not everything will freeze. It will get deathly cold, but our shelters run deep, and are well-protected. And though the storm will be bad, it will not last long. That’s the truth: it will not last long. At some point, perhaps in four years, perhaps in only two when the new Congress is elected, the storm will break, and the skies will clear. Then we will have to see if there is another storm behind this one. It is possible, you know. This storm may last eight years. If it does, we’re going to have a lot of frostbite. But think of this. No party has won three elections in a row since Bush followed Reagan. Before that, not since Truman followed Roosevelt. Twice in almost a century have we had a Democratic president after a Democrat, or a Republican after a Republican – Johnson following Kennedy and Ford following Nixon notwithstanding, for obvious reasons. Which means that things will change. The storm will end. Believe it. Here’s what we hope for, between now and then. Hope that the storm does some good. Storms do, you know. They wash things clean, they break away dead branches and scour away debris. I am a progressive, and I believe in the power of government to do good things; but the truth is that our government has a lot of debris stuck in its branches. And some dead branches, I think. It is entirely possible that, even while it harms and breaks good things, the storm will also clear away some of the bad. We have to hope so. Maybe there will be some positive effects. The key for us – for all of us – is going to be objectivity. We must be dispassionate, and we must be rational. Reasonable people can agree, can compromise, and what was most noticeably absent from this last election was reason — and therefore agreement, and therefore compromise. To keep the weather metaphor: some people like cold weather, like storms, like the rain; other people prefer warm sunshine. But only unreasonable people claim that there is nothing good about cold, that only warm sunshine can ever be acceptable; only unreasonable people claim to hate it when the sky clears and the sun comes out, at least once in a while. Reasonable people realize that Arizona summers are too freaking hot, that New England winters are too freaking cold, that the Pacific Northwest is too overcast and rainy, and the Southeast is too muggy. We have to be reasonable. If the Republican control of the government leads to some good things, leads to some reductions in unnecessary regulations (and there are such), leads to some reversal of government overreach and invasion into private lives (and there is such), then we must be happy that good things are happening. We must not make the same mistake that unreasonable people have made when they have claimed that, for instance, President Obama has been bad for the economy. Or that the First Family has been an embarrassment to the country. Hate Obamacare all you want, but the economy has turned around since the recession. (And I say Fie to anyone who claims that the economy would have grown faster had the president for the last eight years been Republican. Fie. Prove it. Show me where economic predictions have ever been reliable. If a simple cause and effect were provably true, the argument would be over. It ain’t. So fie.) The Obama family are a model of dignity and grace. So let’s not make the same mistake. Let us be reasonable. Let us take the long view and see: if a thing is broken or taken away, was that thing actually necessary? Perhaps not. Perhaps when Obamacare is destroyed by the storm, we will come out of our shelters when the sky clears and build something even better. ‘You ain’t grievin’, Miss Maudie?’ I asked, surprised. Atticus said her house was nearly all she had. There are ways of doing things. That’s how we have to see this. Like the burning down of an old house. It’s dangerous and damaging – and we have to try to fight the fire, and we have to try to save what we can from its flames – but we have to remember that after the storm, after the fire, life goes on. And maybe the new day will dawn even brighter. Anything that is destroyed that shouldn’t be, we can rebuild. Maybe we can even make it better. Now: that is me being reasonable, because we should be, about Republican control of government. Republicans are not fools, and are not evil; though I think political parties are harmful to this country, it is certainly true that two parties are necessary, that one party alone, even my party, would be doomed. I think of when Frodo offers the One Ring to Galadriel, and she refuses it because she would become a queen, awesome and terrible — “All will worship me and despair,” she says, as she’s imagining it. Gandalf turns it down, too, for the same reason: nobody can use it safely, even if they mean to do good. The federal government is, in some ways, the Ring. The key to using it safely is in numbers: no one person can hold it for too long; no person can go it alone. Frodo never makes it to Mt. Doom without Samwise. Realize that, while we seem to have handed the Ring to Denethor, the madman on the throne of Gondor, it wouldn’t be any better if we hung on to it ourselves: we’d go mad like Frodo does, and decide to keep the Ring for ourselves. That is a fate to be feared no less because progressives have, I think, the right idea. I may write more about this another time. For now, let’s talk about the other part of the winter storm scene from To Kill a Mockingbird: let’s talk about the Morphodite. You remember the Morphodite, right? The snowman that Jem and Scout build, that is actually only a coating of clean snow over a big ball of mud? Right. Jem turns him into a caricature of their loud, obnoxious neighbor Mr. Avery, but at Atticus’s request, he changes it into a more innocent imitation of Miss Maudie, dressing it with her sun hat and hedge clippers. She, of course, takes it as an insult (though she doesn’t mind too much) and names it a morphodite, meaning a thing that changes its shape. The Morphodite melts in the heat of the burning house, and Scout and Jem have to clean up the muddy, filthy, sticky mess. So here’s the thing with the Morphodite. He was picked largely as an alternative to a lot of bad choices, mostly (but not solely) on the Republican side. I still believe, absolutely, that he entered the race solely to increase his name recognition and give himself a veneer of patriotism; maybe to make some political connections he could use to his advantage for his business. I think nobody was more shocked than he when he started winning, and that state of shock continued all the way through the final victory. I mean, he’s been unprepared the whole way; it’s no less true now. And he’s filling his cabinet with people who are likely to support him and his ideas personally, with their own selfish interests in mind, rather than people who are civic-minded, or who will likely consider what is best for the American people before considering what is best for themselves. Just like him. The man’s a narcissist, that much is clear. 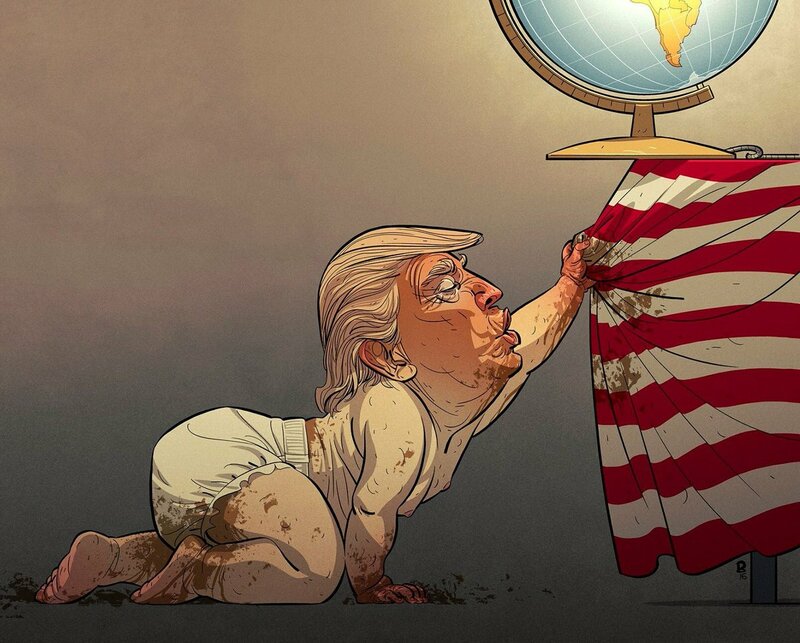 He acts like a spoiled child: and he seems happiest when he breaks things and gets attention, which he then turns into more attention as he mocks the people who chastise him for breaking things. He thrives on attention. It is why he entered the race, why he ran so hard and why he has acted the way he has since his election. So what do you do with a spoiled child who acts out for attention? You ignore him. Don’t give him the satisfaction. Don’t give him what he wants, because it is the only thing he wants, and he doesn’t care in the least if it is good attention or bad attention. All he wants is for people to talk about him. So stop. Stop using his name. Fortunately there are a thousand alternatives, from John Oliver’s call to make Donald Drumpf again, to the various versions of orange-themed insults that plaster the internet. Any of those are fine; he wants to see his name, his actual name. I think he prefers The D_____, actually, though clearly the last name, associated with the business, is the #1 priority. But there are so many others, too: Rump. Dump. Chump. Chimp! Lump, Slump, Gump, Hump (Wait — not that one. Too close to home. ), Bump, Thump, Clump. So many possibilities, and not a one of them will give him what he wants. If you feel a call to protest, please do. But address your concerns to the part of the government that is actually still a government. And when the reality TV guy comes on stage — change the channel. Or better yet, just turn him off. Let him melt back into a puddle of goo. Then we can have a couple of kids rake him up and throw him away.